The basic concepts of Site Conservation Planning are outlined above. What follows is an example of how such planning was applied at one military installation, Arnold Air Force Base in Tennessee, using the base's Integrated Natural Resources Management Plan. On the base's 40,000 acres is the vast Arnold Engineering Design Center, which operates 53 wind tunnels and other specialized units. The first phase of conservation planning at AAFB was completed in 1999, with participation from invited stakeholders. 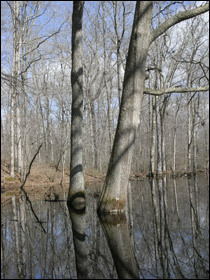 The conservation planning effort was revisited in 2001 during an internal meeting of AAFB's conservation program, facilitated by The Nature Conservancy. The most recent revisions were developed during internal meetings in 2005 and were presented to the USFWS, Tennessee Wildlife Resources Agency, Tennessee Army National Guard, and Tennessee Department of Environment and Conservation for comment. During and following the 2001 and 2005 meetings, the conservation planning process for AAFB was documented in a spreadsheet application designed for that purpose by TNC. The following paragraphs describe the conservation planning process at Arnold and present the revised focal conservation targets for AAFB that resulted from the internal meetings during 2005. The woodland/savanna/shrubland system target is a gradient of successional stages that may intermingle spatially. Included in this focal target are rare plants (i.e., Eggert's sunflower and others), two plant communities, and the faunal communities they support. Rare faunal communities include several high-priority bird species on the Partners in Flight lists and a highly diverse reptile community, which includes the state threatened pine snake. This target will be used as an example through the remainder of this case.